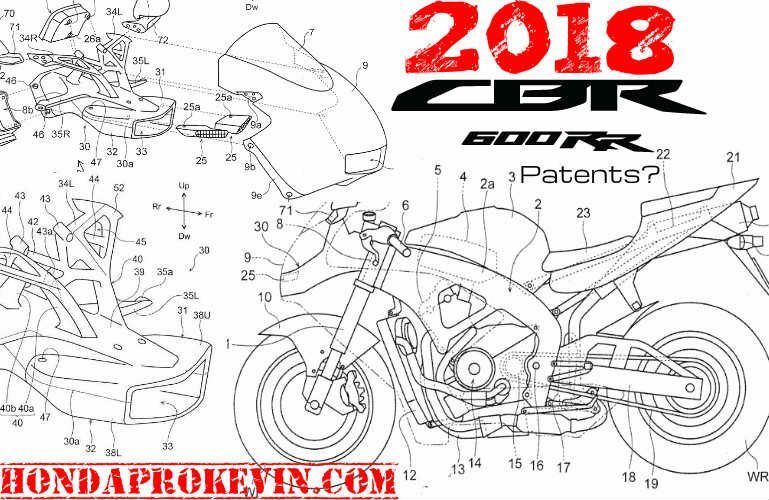 The patent documents below show what looks to possibly be a CBR600RR (below, I’ve included a stock picture of the current 2017 CBR600RR for reference). 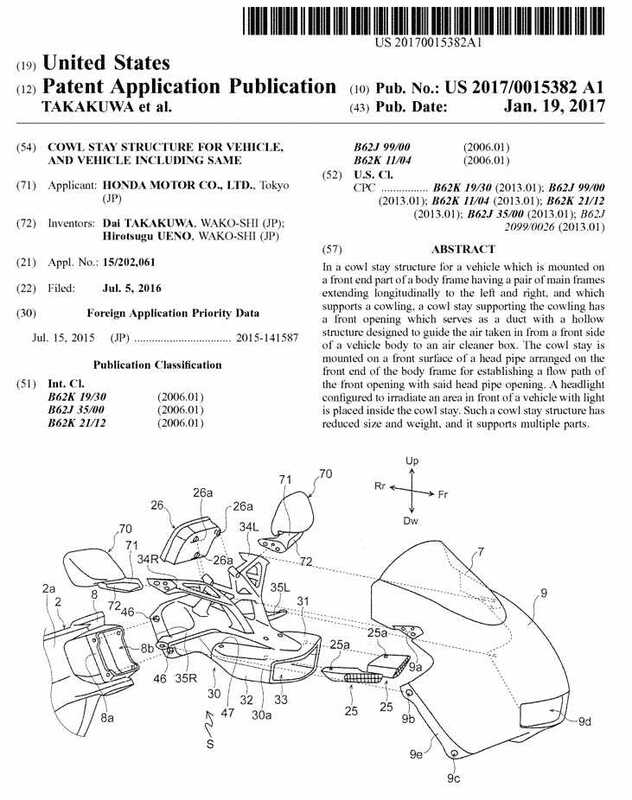 Could it be the 2018 CBR 600 RR from Honda in the patent documents below? 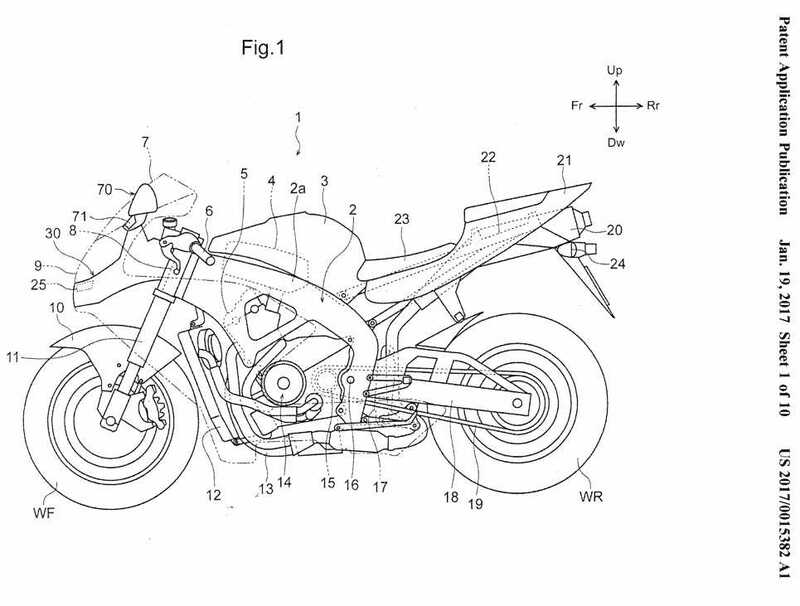 Aside from the changes to the front-end which is what this current patent is for, everything else looks identical to a 2017-2007 CBR600RR. 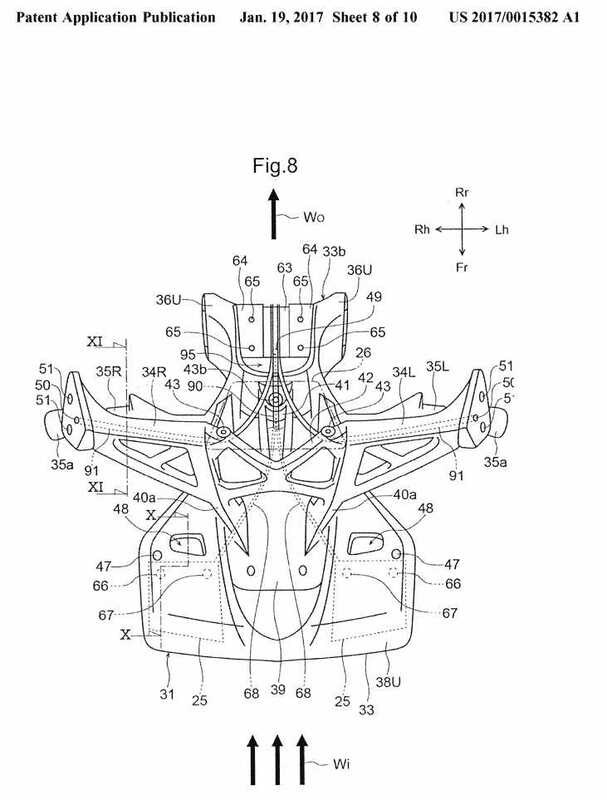 Does this mean Honda is going to pull what Yamaha did for 2017 with the YZF-R6 and just throw some aesthetic changes its way and possibly some electronics that will trickle down from its big brother – the 2017 CBR1000RR that received a host of new goodies as it was a frame up redesign? Will the 2018 CBR600RR pack some sort of traction control etc? That would be a fairly ‘cheap’ way for Honda to squeeze a few more years out of an already tired platform. Don’t get me wrong, it’s still a great platform but in the grand-scheme of things the Honda is starting to become dated. 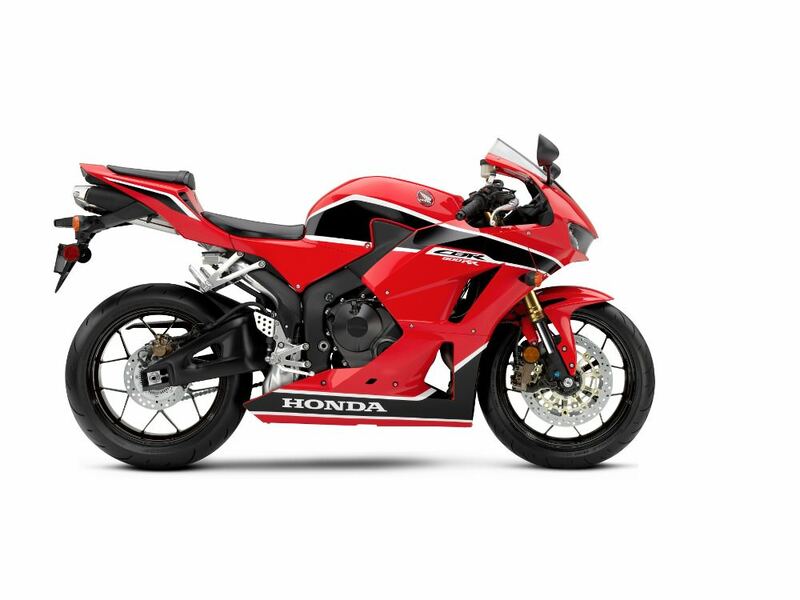 I’ve been hoping and waiting patiently for Honda to give me a reason to upgrade my 07′ CBR600RR track-bike but it hasn’t happened yet – sadly. 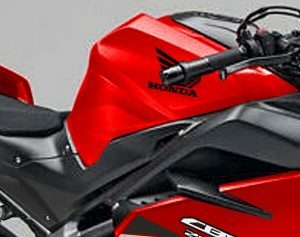 Personally, I want to see Honda do what they did back in 2007 and release a game-changer into the 600cc supersport bike model lineup for 2018 but deep down I can see why that may be far fetched to say the least. The 600cc sport bike market has been dwindling further and further down year after year for quite some time now as their 1000cc superbike big brothers have been getting all of the attention and that’s for all manufacturers. If people aren’t buying 600’s then they have no reason to dump millions of R&D $$ into them to make more horsepower, lighter, better parts etc. Before I end up typing out a novel on my opinions regarding the 600cc class and what’s happened to them over the years, I’m going to stop there haha. What do you guys think? In a perfect world… What changes would you like to see Honda throw at the 2018 CBR600RR? Would you pay upwards of a $13,000+ price-tag for a 2018 CBR600RR with the same electronic bells and whistles, suspension goodies etc that the 2017 CBR1000RR was blessed with? The present invention relates to a cowl stay structure for a vehicle, and to a vehicle including the same. 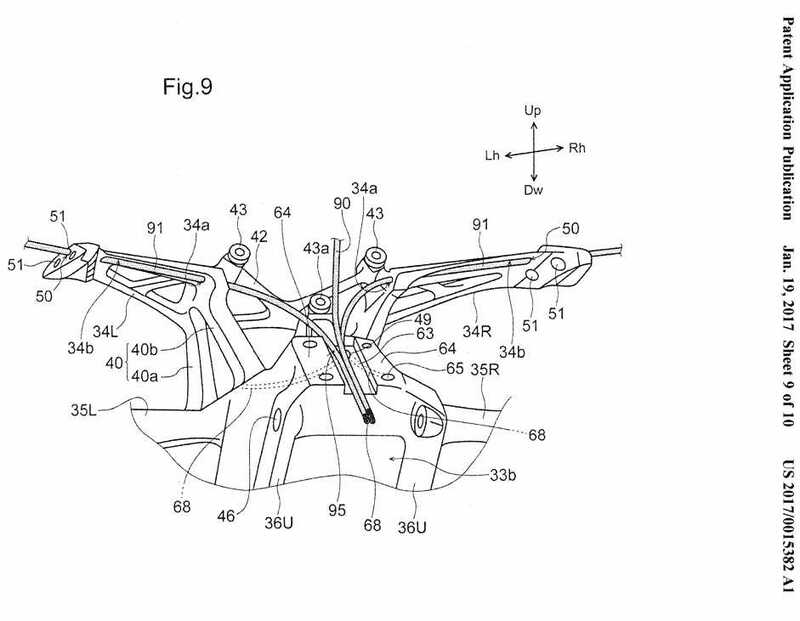 More particularly, the present invention relates to a cowl stay structure including a cowl stay for a vehicle for fixing, on a body frame, a cowling as an exterior part to cover a front part of a vehicle body, and to a vehicle including the same. There is known structure of a motorcycle in which a meter device, a headlight, a rear-view mirror, a cowling as a windscreen device, and the like are mounted at the front side of a steering handlebar in the motorcycle. 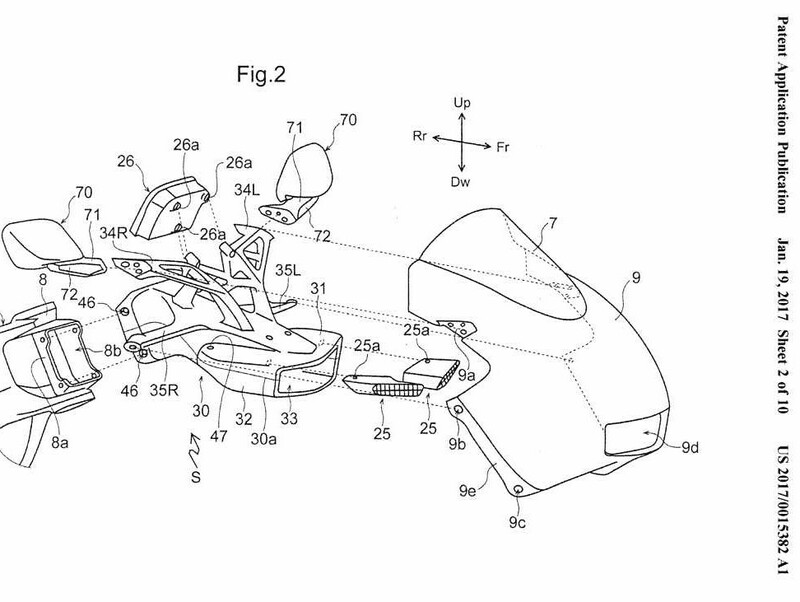 For example, the Japanese Patent Application Publication No. 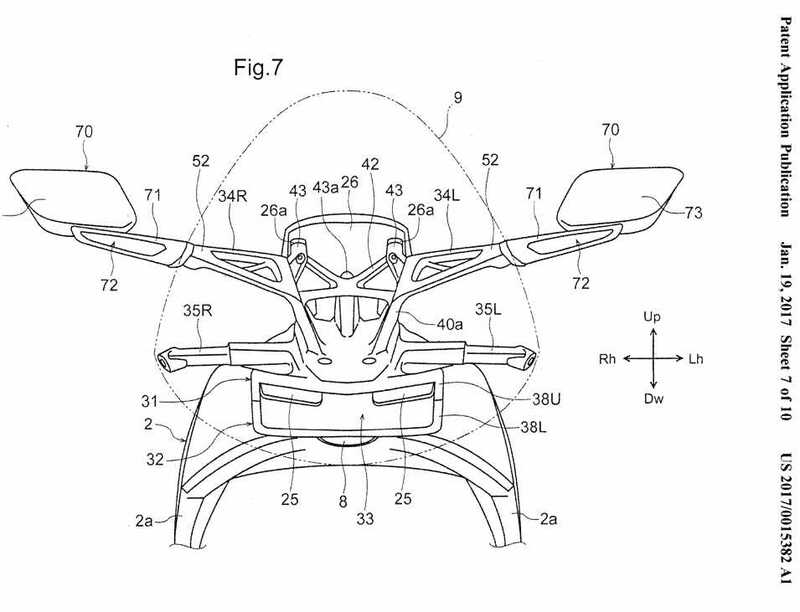 Hei 9-95273 discloses a motorcycle with the number of parts reduced by integrating stays for mounting a meter device, a headlight, a rearview mirror, and the like into a cowl stay for mounting a cowling to a body frame. However, to make the cowl stay support the multiple parts, a problem arises in which the cowl stay tends to increase in size due to its complicated structure, and also tends to increase in weight to secure necessary strength. 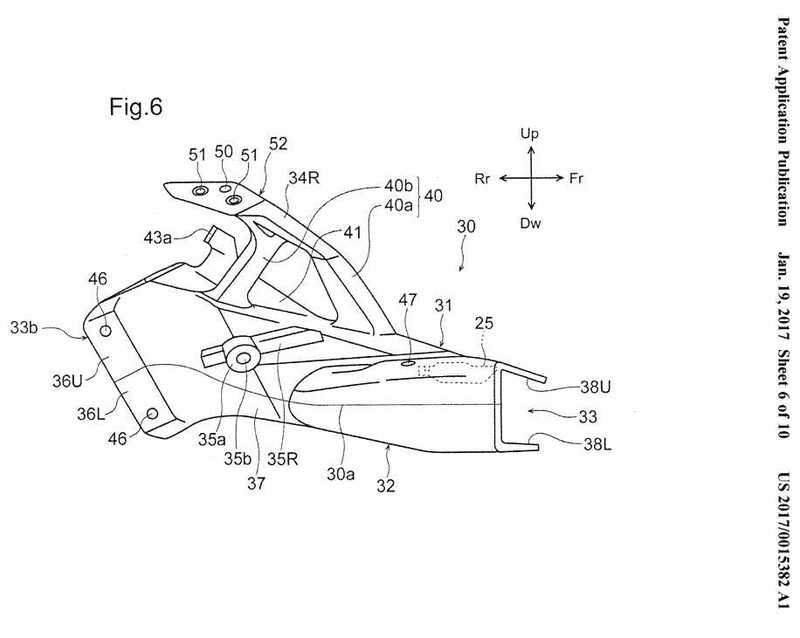 An objective of the present invention is to solve the problem of the existing technique described above, and to provide a cowl stay structure for a vehicle which enables a cowl stay to reduce its size and weight while supporting multiple parts. Reference numbers are included in the following description corresponding to the reference numbers used in the drawings. Such reference numbers are provided for purposes of illustration, and are not intended to limit the invention. 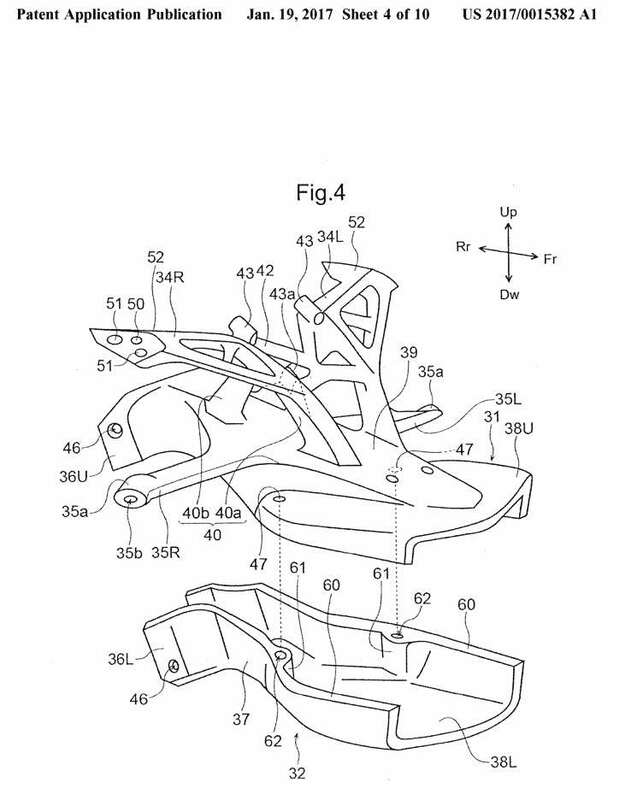 In order to achieve the above objects, the present invention according to a first aspect thereof provides a cowl stay structure (S) including a cowl stay (30) for a vehicle which is mounted on a front end part of a body frame (2) and supports a cowling (9), characterized in that the cowl stay (30) supporting the cowling (9) has a front opening (33) which serves as a duct with a hollow structure designed to guide the air taken in from the front side of a vehicle body to an air cleaner box (4), the cowl stay (30) is mounted on the front surface of a head pipe (8), mounted on the front end of the body frame (2), so as to close a head pipe opening (8b) which is formed in the head pipe (8) and serves as an air intake for the air cleaner box (4), and a headlight (25) configured to irradiate an area in front of a vehicle (1) with light is placed inside the cowl stay (30). Further, the present invention according to a second aspect thereof is characterized in that the cowl stay (30) is formed from an upper member (31) and a lower member (32) into which the hollow structure is divided vertically, the upper member (31) supports at least the cowling (9) and the headlight (25), the upper member (31) and the lower member (32) are made of members (materials) different in strength such that the upper member (31) is made of material having higher strength than that of the lower member (32). Further, the present invention according to a third aspect thereof is characterized in that a pair of left and right upward extending portions (40) extending upward is provided on an upper surface of the cowl stay (30), upper end parts of the respective upward extending portions (40) are coupled together by a coupling portion (42) having a truss structure, and a mounting boss (43, 43a) which supports a meter device (26) configured to display vehicle information is provided on the coupling portion (42). Further, the present invention according to a fourth aspect thereof is characterized in that the structure includes a pair of first laterally extending portions (34L, 34R) which are coupled to the upper end parts of the upward extending portions (40) and extend outward in the vehicle widthwise direction, and the first laterally extending portions (34L, 34R) each support at least one of a rearview mirror (70) and a direction indicator (71) at a direction indicator supporting portion (52). Further, the present invention according to a fifth aspect thereof is characterized in that the first laterally extending portions (34L, 34R) each include a truss-shaped thinning portion (45). Further, the present invention according to a sixth aspect thereof is characterized in that a through hole (49) through which a headlight harness (68) configured to supply power to the headlight (25) passes is formed in the cowl stay (30) at a position behind the meter device (26), and, in an area behind the meter device (26), the headlight harness (68) constitutes a junction area (95) where the headlight harness meets with a meter device harness (90) coupled to the meter device (26). Further, the present invention according to a seventh aspect thereof is characterized in that a direction indicator harness (91) configured to supply power to each direction indicator (71) is routed along guide grooves (34b) which are respectively formed in the first laterally extending portions (34L, 34R) to have a C shape in cross section, and the direction indicator harness meets with the headlight harness (68) and the meter device harness (90) at the junction area (95). Further, the present invention according to an eighth aspect thereof is characterized in that a rear opening (33b) of the cowl stay (30) is fixed on a box-shaped standing wall (8a), defining the head pipe opening (8b) of the head pipe (8), with multiple fastening members fastened into the cowl stay and the standing wall from the outer side in the vehicle widthwise direction. According to the first aspect of the present invention, the cowl stay (30) supporting the cowling (9) has the front opening (33) which serves as a duct with a hollow structure designed to guide the air taken in from the front side of the vehicle body to the air cleaner box (4), the cowl stay (30) is mounted on the front surface of the head pipe (8), mounted on the front end of the body frame (2), so as to close the head pipe opening (8b) which is formed in the head pipe (8) and serves as the air intake for the air cleaner box (4), and the headlight (25) configured to irradiate an area in front of the vehicle (1) with light is placed inside the cowl stay (30). Thus, the cowl stay serves also as a duct with a hollow structure designed to guide the air taken in from the front side of the vehicle body to the cleaner box, whereby the number of parts can be reduced. In addition, the headlight is placed inside the cowl stay with a hollow structure, which simplifies the structure of the cowl stay and downsizes the cowl stay. Further, in a vehicle having a structure of guiding the air introduced from the front side of a vehicle body from the front side to the rear side of a body frame through an opening formed in a head pipe, the cowl stay can be installed at a position closing this opening and at the best position for the cowl stay to support a cowling. According to the second aspect of the present invention, the cowl stay (30) is formed from the upper member (31) and the lower member (32) into which the hollow structure is divided vertically, the upper member (31) supports at least the cowling (9) and the headlight (25), the upper member (31) and the lower member (32) are made of members different in strength, and the upper member (31) is made of a member having higher strength than that of the lower member (32). Thus, a member with high strength is used only for the upper cowl stay which needs strength for supporting multiple parts, which enables the cowl stay to reduce its total weight while securing sufficient strength. According to the third aspect of the present invention, the pair of left and right upward extending portions (40) extending upward is provided on the upper surface of the cowl stay (30), the upper end parts of the respective upward extending portions (40) are coupled together by the coupling portion (42) having a truss structure, and the mounting boss (43, 43a) which supports the meter device (26) configured to display vehicle information is provided on the coupling portion (42). Thus, the coupling portion with a truss structure can increase the rigidity of the upward extending portions and the cowl stay, whereby the cowl stay can be reduced in size and also reduced in weight due to the thinning and the like of the cowl stay. In addition, by using the coupling portion, it is possible to support the meter device without increasing the number of parts. 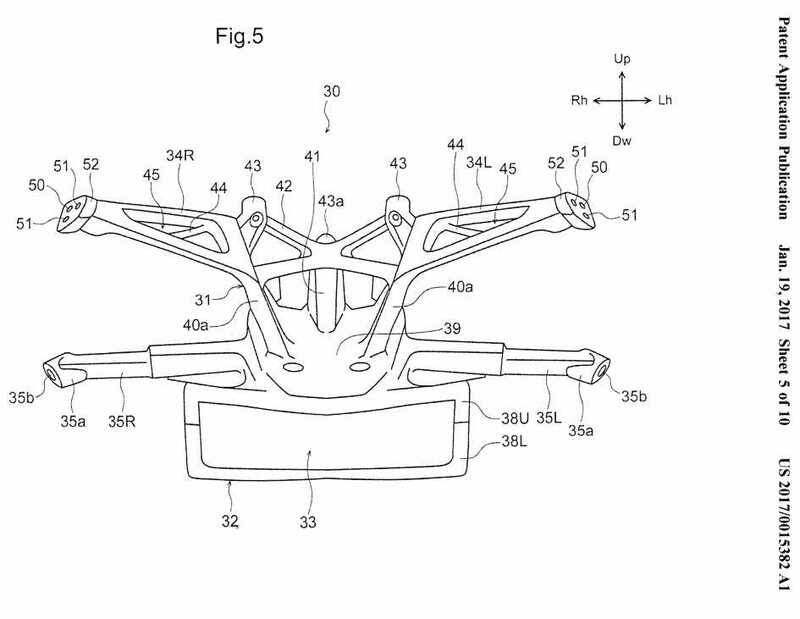 According to the fourth aspect of the present invention, the cowl stay structure (S) includes the pair of first laterally extending portions (34L, 34R) which are coupled to the upper end parts of the upward extending portions (40) and extend outward in the vehicle widthwise direction, and the first laterally extending portions (34L, 34R) each support at least one of the rearview mirror (70) and the direction indicator (71) at the direction indicator supporting portion (52). 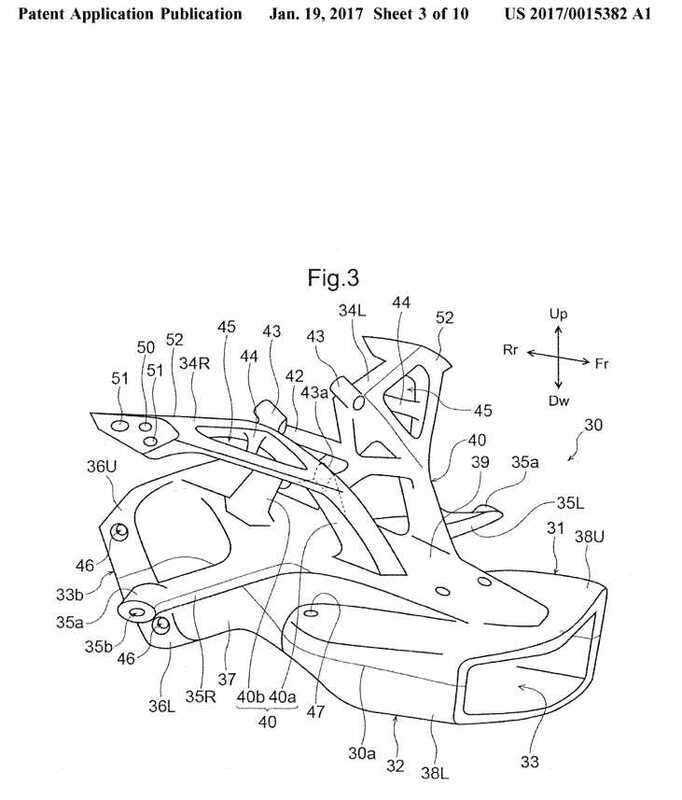 Thus, the rearview mirror and the direction indicator can be supported without any additional part other than the cowl stay, and hence the cowl stay can be downsized while supporting many parts, achieving a compact structure. According to the fifth aspect of the present invention, the first laterally extending portions (34L, 34R) each include a truss-shaped thinning portion (45). Thus, the cowl stay can be reduced in weight while keeping its strength. According to the sixth aspect of the present invention, the through hole (49) through which the headlight harness (68) configured to supply power to the headlight (25) passes is formed in the cowl stay (30) at a position behind the meter device (26), and in an area behind the meter device (26), the headlight harness (68) constitutes the junction area (95) where the headlight harness meets with the meter device harness (90) coupled to the meter device (26). Since the harnesses meet through the insertion hole, the harness routing structure can be simplified. Thereby, the routing distance of the harnesses can be shortened, which reduces cost and achieves a compact structure of the cowl stay. According to the seventh aspect of the present invention, the direction indicator harness (91) configured to supply power to each direction indicator (71) is routed along the guide grooves (34b) which are respectively formed in the first laterally extending portions (34L, 34R) to have a C shape in cross section, and the direction indicator harness meets with the headlight harness (68) and the meter device harness (90) at the junction area (95). Since the guide grooves are formed in the first laterally extending portions, additional harness guides do not have to be provided, whereby the number of parts can be reduced and the cowl stay can be downsized and achieve a compact structure. According to the eighth aspect of the present invention, the rear opening (33b) of the cowl stay (30) is fixed on the box-shaped standing wall (8a), defining the head pipe opening (8b) of the head pipe (8), with the multiple fastening members fastened into the cowl stay and the standing wall from the outer side in the vehicle widthwise direction. This makes it possible to increase strength in supporting the cowl stay and downsize the cowl stay.